Have any old 35mm negative films or slides? Here's the perfect device to help you easily organize and externalize them. Once scanning is complete, the built-in 2.4'' LCD screen will display your digitized image. Scan and convert the old negatives or slides film to be JPG digital file and save into SD card. To keep old classic photo with wonderful memorable moment forever. 5/10 Mega Pixel Stand alone Film/Slide, scan film to your SD card or computer in 1800DPI high resolution. 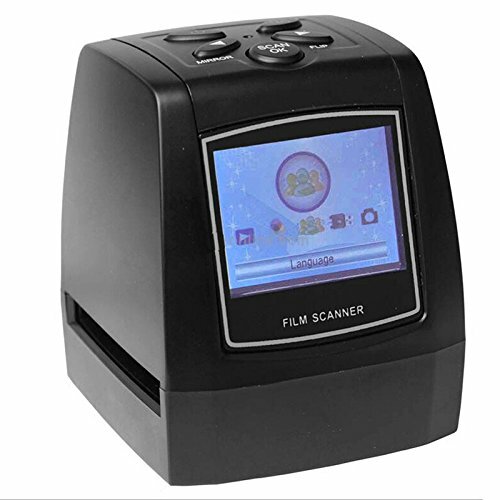 2.4 LCD Full Color Screen for easy viewing,you can look it clearly before scanning. Support to connect NTSC/PAL TV through TV-OUT port of this film photo scanner device. It's easy to use it. User can save digital photo to SD card. Also support TV out to connect with TV and share the digital photo on big screen. USB power supply, plug and play. If you have any questions about this product by Del-Digital, contact us by completing and submitting the form below. If you are looking for a specif part number, please include it with your message.